When you need a kitchen appliance fixing, it’s important that you feel confident about the engineer’s ability to complete the job safely, honestly and efficiently. Repairing electrical appliances requires professional training and a high level of skill, whether it’s a small item like a kettle or toaster, or a larger appliance such as a fridge, washing machine or oven. Knowing how to spot a trustworthy appliance repair specialist in the Portsmouth and Winchester areas is all about rooting out the ‘cowboys’. Using your intuition is a big part of this – if you feel uncomfortable about anything an engineer is proposing, tell them about your concerns. If they are unable to ease your worries, don’t feel like you have to hire them. There’s no better way to get an idea of a company’s reputation than to listen to past customers. Look beyond the testimonials on a company’s website – these can be edited easily and might be misleading. Specialist trade comparison sites such as checkatrade.com or trustatrader.com are great tools for checking a company’s credentials and gauging their reputation. 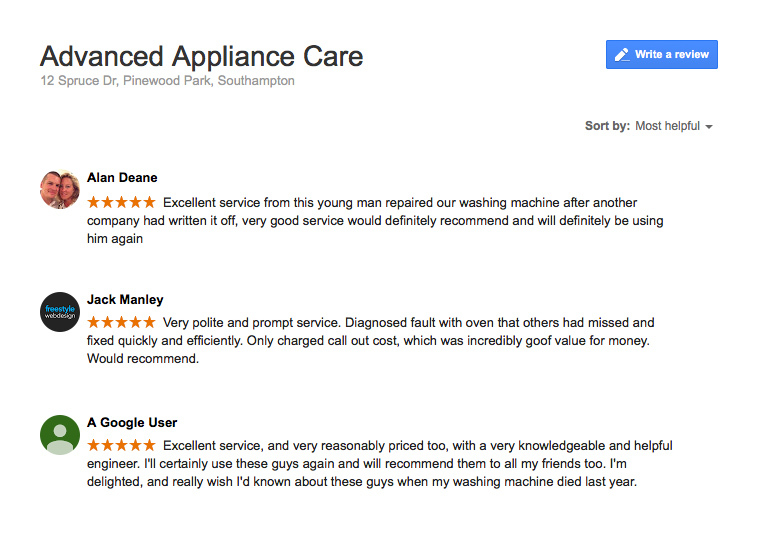 Here at Advanced Appliance Care, we’re proud to have an average overall rating of 9.96 – and we actively encourage our customers to leave reviews and ratings. It’s important that you know how much the repair work is going to cost before you hire an engineer, so make sure you ask them for a quote. Some companies offer some sort of fixed price guarantee, which is good because it means you won’t be faced with unexpected costs once the work is done. We offer our customers in Portsmouth and Winchester a fixed diagnostic cost and, once we’ve found the fault, a fixed quotation for the repair work. Your safety is paramount when it comes to repairing electrical appliances, and any experienced repair specialist knows that a full safety test should be carried out on the appliance once it has been repaired. This means checking that the parts are completely secure and that electricity can pass through safely. If your engineer does not do this, you have every right to insist, and we’d advise not using the appliance until it has been tested. Here at Advanced Appliance Care, our skilled team is fully trained and experienced in delivering exceptional service and safe appliance repair. If you live in Portsmouth, Winchester, Southampton, Romsey or Andover and need a repair specialist you can trust, contact us today. We don’t believe in hidden costs and half-hearted jobs – just good, honest work.